As volatility has returned to the stock and bond markets over the last few weeks, I wanted to share some thoughts on what we have been experiencing and where we might be going from here. Speaking of the word volatility, it sure gets overused in the financial world, doesn’t it? It seems to me that the word “volatility” is usually just code for “sharp and sudden drops in stock prices.” If you think about it, we don’t normally use that word when we experience sharp increases in stock prices, and we have experienced many of those days over the last few years. However, when volatility works against us and we see the values of our investments go down, the “v word” gets used in the same sentence as “plunge” and “plummet” and “rout,” and along with other words intentionally used to get our heart beating a little faster. The frustrating thing is that even though we know better and we understand why folks in the financial media use those words in their headlines, it still gets me almost every time! Those days where the market drops 3-4% in just a few hours are quite scary, and I think it’s totally natural to feel a little nervous and worried that things might get even worse before they get better. We can look at all of the historical stock charts and clearly see that the market has never gone down without eventually going back up. We can also stare at the long-term upward trend of the stock market until our eyes go crossed, but all of that information doesn’t seem to help when we’re “in the moment” and we’re experiencing those losses in real time. It is also a common reaction when we’re experiencing this volatility to think that “this time it’s different,” and as the computer-driven, algorithmic trading (mainly hedge funds) has become more prevalent in our investment world, the market does seem to feel a bit different and things do seem to happen quicker than they have in the past. The truth is that these types of drawdowns (another code word for “quick, drastic decline in stock prices”) happen to us almost every year. 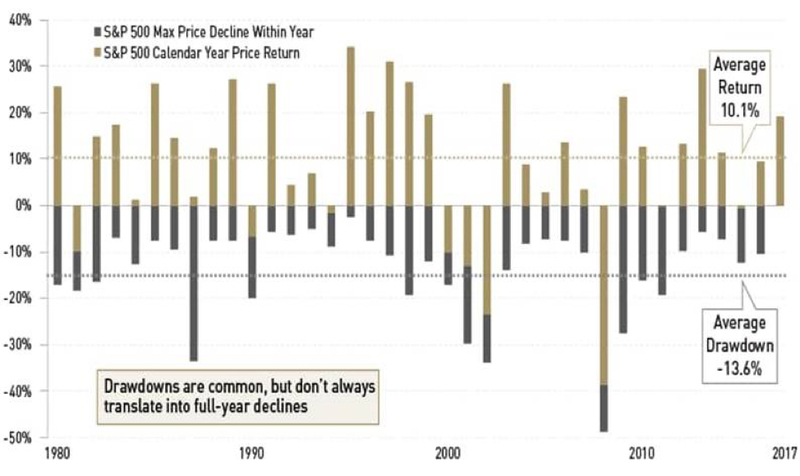 When we look at charts like the one below, we can quickly see that it is very common for the market to drop 6 – 10% in any given year (at some point throughout the year), and those drawdowns do not necessarily preclude the market from having a good year – or a great year in some instances. So, what do we do during these times? 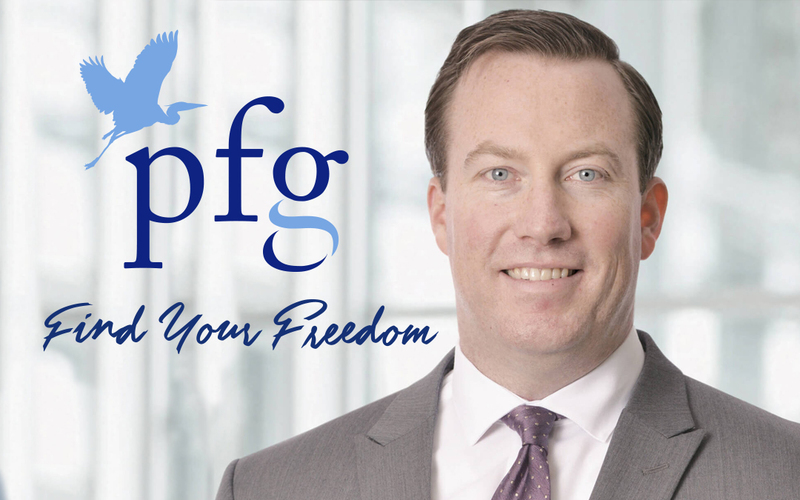 First and foremost, we’re checking-in and listening very closely to the analysts and experts that we trust at Raymond James and other firms to hear their thoughts and to learn what it is that they are watching as things unfold. There is no shortage of opinions out there, as you know, and it’s very difficult to cut through the noise to determine what is important and what is being written or said to draw attention. We gather as much data as we can and then focus on making the best decisions we can given the set of facts and information at hand. When the facts and information changes, we know we have to change our course of action, as well. Through the last several pullbacks (another code word) that we have experienced since the Financial Crisis, we believe, the best course of action has been to do nothing and/or increase the amount invested in stocks. We know this only with the benefit of hindsight, of course. The general feeling this time around is very much the same. This pullback looks and feels very similar to what we just experienced in February of this year. The underlying fundamentals still appear to be intact. The strong earnings growth that we are seeing here with US companies appears to be continuing and that is what we think is ultimately driving the market higher. That’s certainly not to say there is nothing to worry about. We worry even more when there appears to be nothing to worry about, but our analysts and strategists feel very strongly that we’re still in a cyclical bull market that should have years left to run. That’s comforting and it helps during times like this, but at some point, that will change and, like I said, when the facts and information change, we’ll do our best to make the appropriate adjustments at that time. If you’re interested in reading more from the analysts at Raymond James, we’re sharing a few articles from our experts discussing the recent volatility. As always, we’re here to discuss your worries and concerns. If there’s anything we can do to be of service or assistance, please don’t hesitate to let us know. The information contained in this material does not purport to be a complete description of the securities, markets, or developments referred to in this material. The information has been obtained from sources considered to be reliable, but we do not guarantee that the foregoing material is accurate or complete. Any opinions are those of Todd Wike and not necessarily those of Raymond James. Expressions of opinion are as of this date and are subject to change without notice. There is no guarantee that these statements, opinions or forecasts provided herein will prove to be correct. Investing involves risk and you may incur a profit or loss regardless of strategy selected. Keep in mind that individuals cannot invest directly in any index, and index performance does not include transaction costs or other fees, which will affect actual investment performance. Individual investor’s results will vary. Past performance does not guarantee future results. Future investment performance cannot be guaranteed, investment yields will fluctuate with market conditions. Chairman’s Council Membership is based on prior fiscal year production. Re-qualification is required annually.